Hello! Happy Friday! 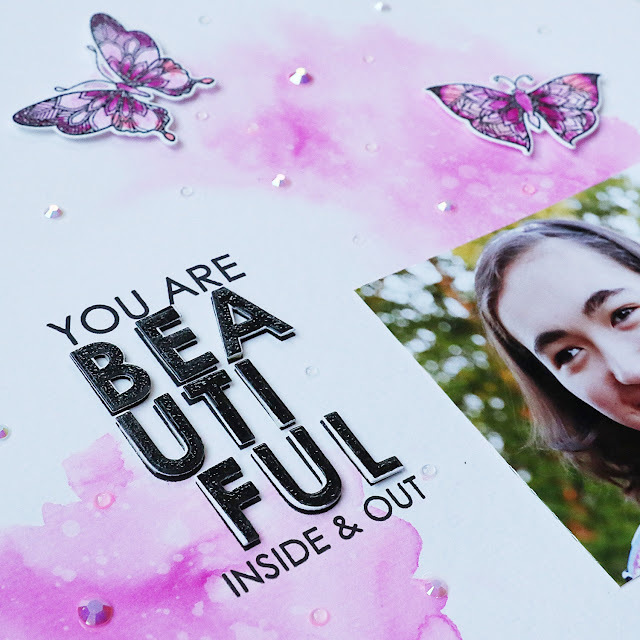 I am in the midst of cleaning and organizing my craft room, but I took a break this week to do some scrapbooking. I have a layout to share today. I used the new Beautiful Butterflies stamp and coordinating Beautiful Butterflies dies from WPlus9. When I saw this set, I knew that I wanted to make a layout with it. These sentiments are perfect for describing my Sabrina, and she loves butterflies, so it was perfect match! I started with a 12x12 sheet of watercolor cardstock. Since her favorite color is pink, I added a little pink watercolor wash background with some Peerless watercolors. Once the first layer was dry, I splattered on some water and let it dry again. 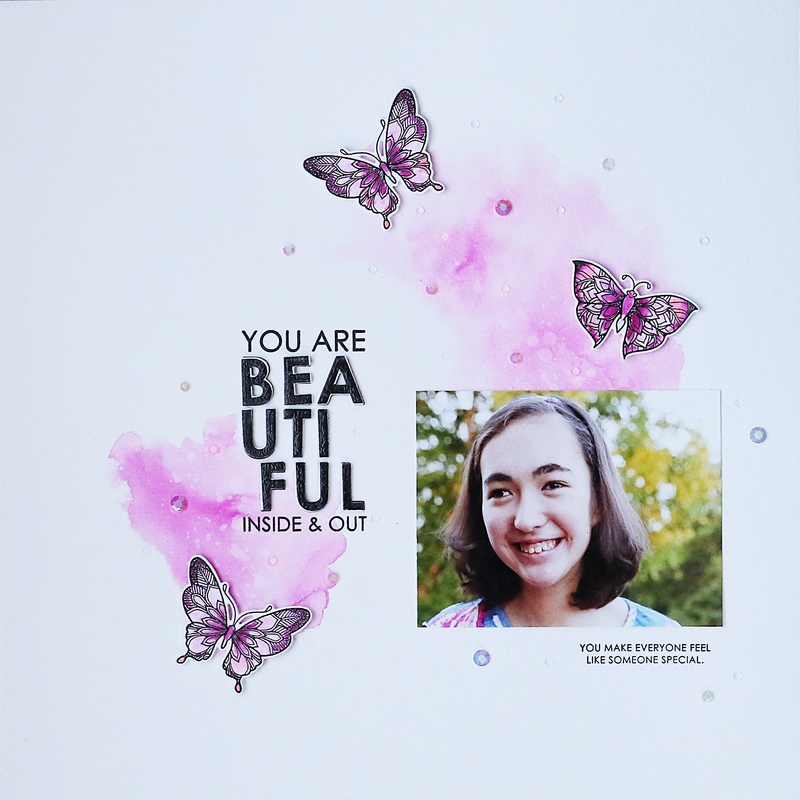 Once I figured out where I wanted to add my photo, I used my Memory Misti tool to stamp both sentiments. For the sentiment above, I stamped it a second time onto scrap piece of watercolor paper using Versafine Onyx Black ink, sprinkled some clear embossing powder over it and heat set it. I used the coordinating die to cut out the letters and popped them up on my layout with tiny pieces of foam tape. I love how the embossing powder adds shine to the letters! There are 2 gorgeous butterfly images included in the set. I stamped these in the same Onyx Black ink and heat embossed clear embossing powder before coloring them with Zig Clean Color Real Brush pens. I know that pink butterflies aren't realistic, but I wanted to continue with the pink theme here. I die cut the butterflies and popped them up with foam tape. 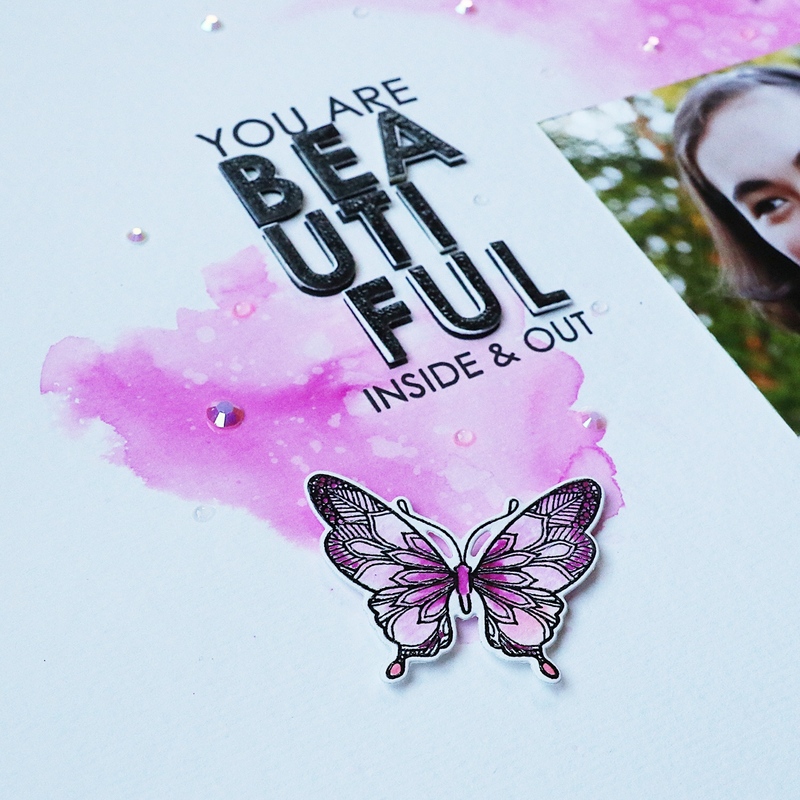 To finish the layout, I added some Pretty Pink Posh sparkling clear jewels and also some random drops of clear Tonic Nuvo crystal drops.